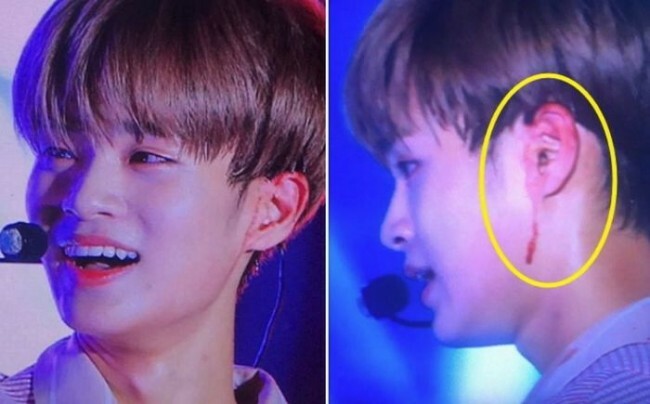 A fan cam had recently captured a video and images of Wanna One member Dae Hwi suffering from a rather dangerous injury during a live performance of their new debut song “Energetic.” Fans were terrified as to what the problem could be but were even more relieved to see his fellow members aiding him quickly. While dancing to the intense choreography, member Woojin had noticed that Dae Hwi’s ear was bleeding rapidly. Other members began noticing too after spotting blood on his clothing and the stage floor. Although the fellow member was shocked, they seemed hesitant to disrupt the performance as well since Daw Hwi showed his effort to push forward to complete the song and dance. After the performance ended, the members immediately surrounded him and provided tissues to stop the bleeding. Fans’ hearts felt touch after seeing the genuine careWanna One show for each other. Although Dae Hwi acted as if it were minor, he did take time to address the wound and rest before performing again! Thank heavens! Check out the scary footage from their performance down below and if you’re easy to become queasy from the sight of blood, fair warning!